Pubescent with long crisp hairs, pale green. Stems: one to two feet high, very leafy. Leaves: lanceolate, sessile. Flowers: in a loose irregular panicle; involucral bracts imbricated in two or three series; rays truncate, five-toothed at the apex. A lovely plant! The pale green stems, leaves, and buds, thickly clothed with fine silvery hairs, and the brilliant golden flowers form an exquisite contrast, delighting the eye of the traveller. This Hawkweed is comparatively rare in the mountains. Hieracium gracile, or Small Hawkweed, has tiny yellow or white flowers borne at the end of the long, slender, branching stems. They resemble miniature Dandelions and are very abundant. Like the Hawksbeards, the rays of the Hawkweeds are truncate, or cut off squarely at the ends, and finely toothed. 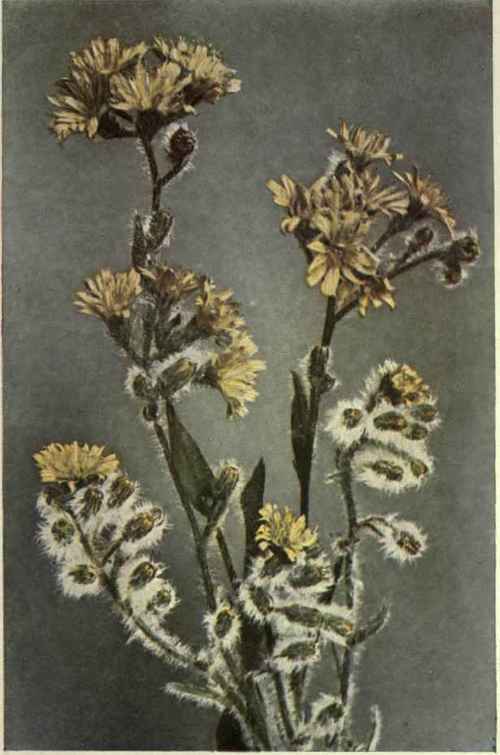 Hieracium umbellatum, or Narrow-leaved Hawkweed, has a tall, simple leafy stem and lanceolate, acute, usually entire, but occasionally toothed or lobed leaves narrowing to a sessile base, smooth above and hairy below, and fringed with marginal hairs. The . few yellow flower heads are usually an inch broad and sub-umbellate.